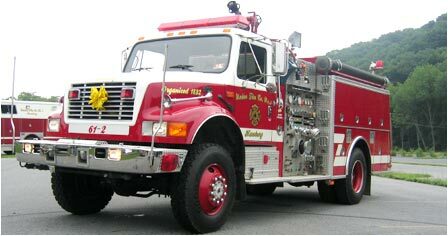 Engine 61-2 is a 1994 KME-International four-wheel drive pumper. The unit is equipped with a 1250 gpm PTO pump which allows it to pump and drive simultaneously, making it an extremely versatile truck for combating brush and wildland fires. The engine is equipped with a 500-gallon tank and ground sweep nozzles in the front bumper. The engine carries 400 feet of booster hose, 300 feet of 1½” hose, 600 feet of 2½” hose, and 1200 feet of 5” hose. The engine also carries a variety of hand tools, 38 feet of ground ladders, and 10 gallons of foam. The engine is also equipped with a generator and complete scene lighting package. In addition to its firefighting duties, the engine is also equipped with a Hurst cutter and combo tool for use at vehicle extrications.